Located over 30 kilometers from Hanoi, cultural complex Viet Phu Thanh Chuong or Thanh Chuong Viet’s Palace is well-known to those who love to discover Vietnamese culture and admire the quintessence of the nation. 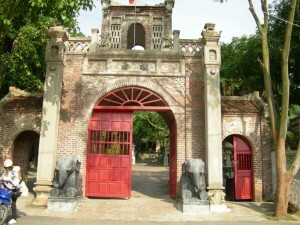 The complex, with its ancient homes, artifacts of Vietnam’s dynasties and surrounding trees, was initially the home and studio of Thanh Chuong, a celebrated painter in contemporary Vietnamese art. 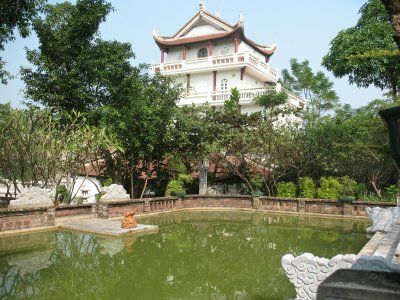 Since its inception in 2002, Thanh Chuong Viet Palace was instantly recognized as a unique cultural preservation resort, a spiritual legacy of Vietnamese art and culture that attracts large numbers of local and foreign visitors, people who love and want to have an in-depth understanding of Vietnamese culture, fine arts and spiritual life. Lying on a hill leaning over Soc Son Mountain in Hien Ninh Commune, Soc Son District, the site covers over 10,000 square meters and keeps thousands of cultural and historical artifacts of the Dinh, Ly, Tran and Le dynasties which artist Thanh Chuong has spent his life collecting and storing. The simple path to the site sees you take in cottage houses, lotus ponds, together with images of water rice civilization such as water ladles, rice mortars, bamboo beds and green-moss stone steps, brings tourists nostalgic feelings and is familiar and cozy. Once at the complex, visitors have a chance to check out old houses belonging to various regions and cultures such as an old stilt house of the Muong ethnic people, a large pond with a stone bridge, a five-storey tower built in ancient style and standing imposingly on a hill. 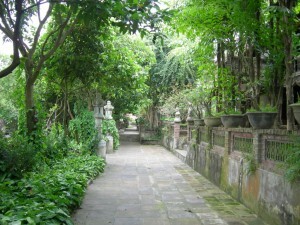 At the middle of the site is an old house brought from the countryside of Nam Dinh Province – there is also a five-storey tower nearby – striking with its architecture of old temples, carved with meticulous and elegant patterns and decorated with many parallel sentences and bas-relief and a house made of terrace-cotta. 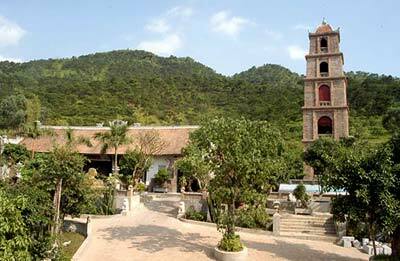 The highlight of the site is a complex of statues made of stone, wood, bronze or ceramic, installed and displayed in the houses and yards around the site.